The ProX / Xstatic T-LS35C is a triangle crank truss system. This medium duty truss lighting stand package includes two high quality crank up stands & three 5FT triangle truss sections that create a 5ft, 10ft or 15ft span. The stand can safely reach to 9-10Ft. A pair T-Adapters are included so you may easily mount your truss to the stands. You can mount up to 200 lbs evenly. truss pipes are 1.5" in diameter. Truss sections are 6 inches in overall width. We set out to find the perfect solution to make the Pocket Pro brighter than its predecessor. We found a new LED source that would produce the output and punch needed in most smaller venues. We've powered the Pocket Pro with a mighty 25W LED engine with crisp optics. Like the Focus Spot Series, the Pocket Pro is designed with the EZ OPEN cover giving full access to the GOBO Wheel. Its compact size and light weight make it ideal for mobile entertainers, small club, and bars, roller rinks, bowling centers or perfect for events and custom GOBO projection in a lounge or retail environment. Compact LED effect light projects countless beams of multicolor light. Simple wireless, non-DMX control from an optional IRC-6 remote. Projects bright, colorful beams using high-power red, green, blue and white LEDs. Trigger built-in automated and sound-activated programs in Master/Slave or DMX mode. Fills the room with eye-catching effects as light shines through 48 lenses. Match the mood at any event by controlling the motor speed in DMX mode. Rugged metal housing ideal for mobile gigs. 3-in-1 LED light that includes a RGBAW rotating derby, red/green laser and white strobe effect. Laser projects thousands of red and green laser beams. Operation allows for separate color and program control. Increase control options using automated and sound-activated programs, or Master/Slave and DMX mode. Bigger shows call for more accessibility and ease of programming. The Obey 70 bridges the gap between smaller rack mount controllers and massive control desks. 14 reversible faders and an assignable joystick allow for easy programming of up to twelve 32-channel fixtures. The Obey 70 can store up to 6 sets of chases containing 240 scenes on 384 total channels of control. Also at your fingertips are fog and strobe control as well as MIDI compatibility. Universal DMX controller capable of handling all the complexities of today's lighting fixtures. Easily control up to 12 intelligent lights with up to 16 channels each. 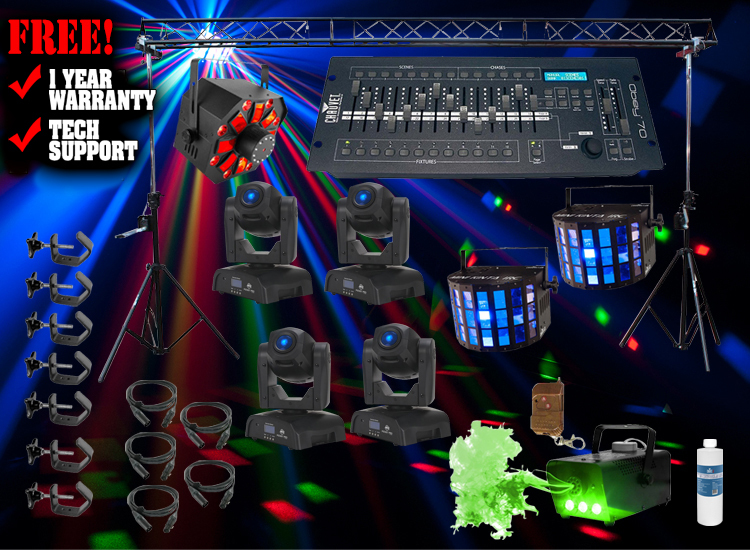 Includes 384 channels of DMX control and 30 banks of 8 scenes for a maximum of 240 scenes. Enhance light shows with 6 sets of chase effects containing 240 scenes. Increase effects with fog and strobe control, reversible sliders, beat activation, tap-sync and auto run. Capability to grab any fixture on the fly, reassign channels and sequentially link chases. Increase flexibility with MIDI compatibility, DMX polarity selector and assignable pressure-sensitive joystick. Conveniently mounts using the 4-space (4U) mounting rack. Everybody knows that parties aren't just about music. You need to create an atmosphere that makes people want to dance all night long. The FOGL500R 500 Watt Fog Machine does just that. It is the perfect addition to any dance floor and will keep the party going well into the early morning hours. This easy to use model is not confusing to set up or operate, so you can just take it out of the box, and in no time you're dance floor will be covered in thick fog that will transform the room into a club-like atmosphere. This is the ultimate mood enhancer that will really get partygoers into the groove. With a variety of placement options, you can set up this fog machine anywhere you like. Position it in an ideal location using the included integrated mounting brackets for a floor setup or it can be ceiling and wall-mounted to keep it out of the way. Either way, you'll be able to tailor your party experience to meet your needs. The FOGL500R can cycle through three different colors of fog to keep the dance floor fresh, and the three built-in LED bulbs have a sound-activated play mode so you can focus on other things without compromising the show. When you do need to make changes, you can use the convenient key chain-style wireless remote with a 100 foot range. You need to do all you can to make sure people are having an awesome time while you're in charge of the party, and atmosphere is the key. You don't want people thinking that you are a lame party host, and you need to make sure that doesn't happen. Your dance floor can stand out with this high quality and inexpensive fog machine and you'll never throw a weak party again. Chauvet fluids are designed and tested to provide exceptional output from Chauvet fog, snow, and bubble machines. The use of other, inferior products can cause irreparable damage to your machine. Play it safe and get maximum output by trusting Chauvet fluids. Formulated specifically for use in all water-based machines. Generates a thick cloud of fog. Will not stain or leave residue. Easy to use mirror ball simulator with high-power, quad-color LEDs. 3 LED zones emit up to 3 different colors simultaneously. Slow rotation speed creates a romantic atmosphere. Digital display allows you to set a color and rotation speed without any controller. Mounts to truss with the included bracket or place it on a stand as a centerpiece. Easily control static colors and automated programs with the optional IRC-6 remote. Generate eye-catching effects with sound-activated and automated programs. Fits best in the CHS-50 VIP gear bag. Box #1 includes: 3 Truss Pieces: 57" x 20" x 9" and weighs approximately 43 lbs. Box #2 includes: 2 Crank stands: 58"x 16" x 9" and weighs approximately 55 lbs. The complete system when assembled weighs 92 lbs. High output mini Moving Head with a bright white 25W LED source. 7 replaceable gobos + spot. Includes kit of 4 additional GOBOs. 2 DMX channel modes: 11 & 13 Channel modes. 540° pan / 230° tilt (16-bit). 5 selectable Dim Curves (Standard, Stage, TV, Architectural & Theater). GOBO size: 18.4 mm (13mm viewable). Optional ADJ UC IR Compatible (Not Included) and Airstream IR Compatible (transmitter Not included). LED Source: 25W White LED source (Rated at approximately 50,000 hrs). (3) Black triangular truss segments and measures 57" x 20" x 9"
(2) Crank stands and measures 58"x 16" x 9"